Some 75 million children around the world do not go to school due to poverty. Of these, about 33 million live in Africa. The eyes of the world will be on South Africa during the 2010 World Cup. Government will use this opportunity, through the 1 GOAL campaign, to raise awareness of the importance of education. Education is the key to break the cycle of poverty for families and communities in South Africa, as well as the rest of the world. 1 GOAL: Education for All, which was started in August 2009, is a global movement to help ensure that every child will get an education. The 2010 World Cup will be used as a platform to promote the campaign. Governments along with world leaders and football teams participating in the World Cup have joined forces to promote the message of education for all. 1 GOAL's global team will voice a collective plea to world leaders to make a pledge of giving every child an education by 2015. The message is that without education, disadvantaged children will never be able to beat poverty and realise their dreams. Children who cannot go to school due to poverty, could be the next generation of doctors, leaders, sport stars or teachers. Unable to read or write, they face a lifetime of poverty, with no hope of a better life. President Jacob Zuma added South Africa's name to the list of countries that are ready to tackle poverty through education. "We have signed up to the 1 GOAL campaign because we believe that it is the responsibility of every government to make a commitment to tackle this indefensible situation," said President Zuma. The 2010 FIFA World Cup was chosen as the platform to highlight the 1 GOAL campaign as it will bring together soccer fans, communities and players who can help spread the message. Head of FIFA, Sepp Blatter, encourages all communities, businesses and individuals to come forward and let their voices be heard. 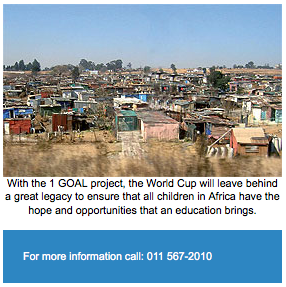 Through the power of football, the 1GOAL campaign can achieve its goal, namely education for all.